The 591 Densimeter Foal Upgrade requires the use of ARS' 180 ul Displacement Pipette, ARS p/n 594KR-1800. The older Rainin pipette, ARS p/n 537-371 cannot be used. Customers who already own the ARS Pipette, and wish to upgrade their 591 densimeter for Foal IgG testing need only purchase the appropriate 591 Densimeter Foal IgG Upgrade below (IGG-101-591B-UG or IGG-101-591A-UG). The 591 Densimeter may be upgraded to measure both sperm concentrations and foal IgG levels. Once loaded, the operator may choose between sperm concentration and foal IgG measurements by simply selecting the desired operation. Current 591 owners may purchase the 591a Densimeter Foal IgG Upgrade (IGG-101-591A-UG) or the 591B upgrade(IGG-101-591B-UG), depending on which model densimeter they own. 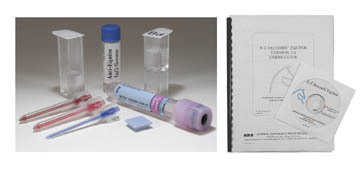 Both upgrade kits include the IgG calibration CD, users guide, Foal IgG Poster and supplies for the first 10 tests.